Turbine-powered race cars were banned long ago by the racing community’s sanctioning bodies, but that won’t stop Keith Hylton and his dream to bring the Turbine T1 to life. 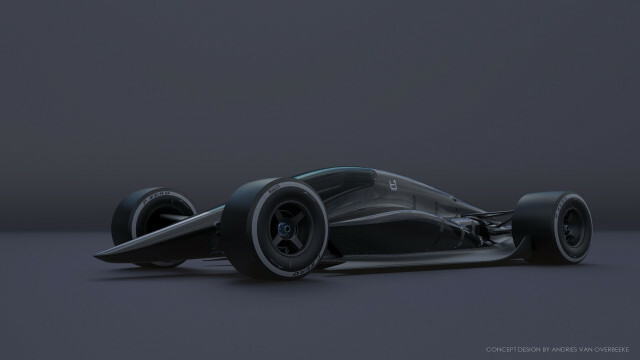 Hylton, a California-based businessman with team ownership experience, calls his T1 Turbine concept race car a new-generation of open-wheel racing and an antidote to uninspired designs. The design was penned by Andries Van Overbeeke, who looked at original fan cars like the Chapparall 2J and Brabham BT46b for inspiration. Replacing the idea of a traditional engine in the T1 is a 700-horsepower, air-cooled Rolls-Royce turbine engine. Hylton claims the engine would have the ability to run 2,000 hours, or roughly 10 seasons, before an overhaul would be required, reducing engine costs by 70 percent. A CVT acts as the transmission. Turbine engines made their biggest splash in the late 1960s when they ran at the Indianapolis 500. Turbine-powered cars almost won the 1967 and ’68 race, but the engine was then banned. It appeared in Formula 1 racing a few years later, but never placed very well. It has been banned from every major racing series for decades. Hylton said the turbine and CVT didn’t fit the bill for racing series at the time, but the technology is now the better fit, in his opinion. His hope is to develop the car and show regulatory bodies a new future for motorsport. Aside from the illegal powertrain, the T1 also boasts a full canopy design. Racer reported Hylton’s distaste for Formula One’s halo and IndyCar’s windshield led to the decision of a full canopy. The monocoque, suspension, and bodywork will all be made from graphene impregnated carbon fiber. The material choice will increase the car’s overall strength and rigidity, Hylton said. And the lack of a rear wing won’t be an issue, either. The production version will use ground effects tunnels to generate enough downforce without the need for a wing. The California businessman has backed the project with his own funds, but if the T1 ever does take to the track, the car will be built as a proof-of-concept first. One day, it could race in its own series, but Hylton clearly dreams of replacing current F1 cars with the T1.